Your collector classic car has front and rear wheel bearings, but the rears rarely require service. They are either "permanently lubricated" when the car is built or get regular lubrication from the rear axle oil. Front wheel bearings do need maintenance, but rarely get it. Usually, they only get checked during a brake job. Back in 1932, Chevrolet recommended "front wheel lubrication" every 2,000 miles with "straight mineral grease entirely free from asbestos fibre or other foreign matter" and cautioned against over-lubrication. By 1956, Buick suggested repacking wheel bearings each 10,000 miles. "Work abut one tablespoon of wheel bearing lubricant into each ball bearing," it said. "Examine oil seal packings for wear or leaking and replace if necessary." The 1969 Chevrolet required repacking every 24,000 miles. Today, this is the normal recommendation — 24,000 miles or every two years. However, if you have an old car like a 1932 Chevy or a 1956 Buick you need to do it more frequently. Wheel bearings for old cars cost $50-$75 or more today, so it pays to keep them properly lubed. They may last nearly as long as your car will. 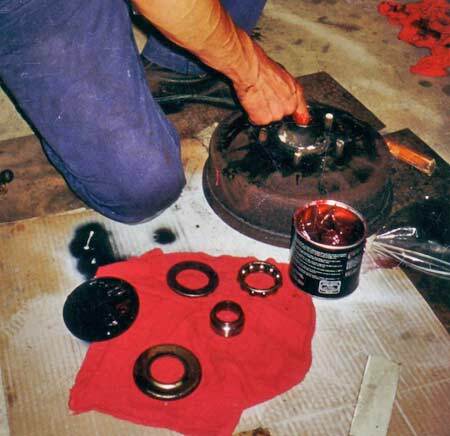 When repacking wheel bearings, you'll get dirty and be using cleaning solvents and grease. Wear latex-free surgical gloves, eye protection and a face mask or respirator to be safe. Old clothes or coveralls are a good idea. Most classic cars have drum brakes and rear-wheel drive and require the following procedures. Set the emergency brake. If the car has automatic transmission, put it in park. Use wheel chocks to prevent rolling. Pry the hubcaps off and loosen the lug nuts with a lug wrench. Don't assume they loosen counter-clockwise. On some old cars they loosen counter-clockwise on one side and counter-clockwise on the other. The lugs may be marked "L" if the car has a left-hand thread. If it does, the lugs tighten to the left and loosen to the right. Use a floor jack, scissor jack or bottle jack to raise the front end. A bumper jack isn't as safe and may bend your re-chromed bumper. Lift one side until the front tire is off the ground. Then, use a stand jack to support the car in this position. Do the same on the other side, so both front wheels are off the ground. Use a floor jack, scissor jack (like this '56 Buick model) or bottle jack to raise the car's front end. A bumper jack won't do a safe job. Starting on one side, remove the wheel and tire. With a wide-jaw pliers and screwdriver, pry the light-metal dust cap off the center of the hub. Put it in a plastic food storage bag along with a drawing or note that tells you where it goes. You will see a nut with cut outs that make it look like the turret of a castle. A cotter pin will run through this nut. After bending the ends of the cotter pin straight and pulling it out, turn the castle nut off with a wrench. Some cars may have a second "adjusting nut" and some use the castle nut as the adjusting nut. To get the bearing and race out, you may need to rock the heavy metal brake drum with the lug-nut studs sticking out of it. Next, you will see a washer with a tang that fits into a slot on the hub. Then comes the outer wheel bearing assembly followed by a smooth metal ring that it fits into called a bearing race. To get the bearing and race out, you may need to rock the brake drum (the heavy metal part with the lug-nut studs protruding from it). On most older collector cars, ball bearings are used. On newer models, you may find pin-shaped roller bearing that taper on one end. As you remove these parts, put each one in a separate food storage bag with notes or drawings. You should indicate which end goes out and other such details. Always treat bearings with great care. Dropping them or scraping them can ruin them. Your next step is removing the brake drum, which includes the wheel hub assembly. As you remove it, be careful not to drag the inner wheel bearing on the spindle that the brake drum rides on. 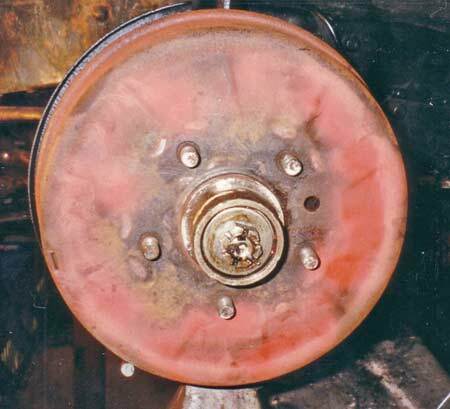 Often the brake drum will pull right off; if it doesn't, you will have to back off the brake adjustment by turning a star-shaped wheel that protrudes on the rear side of the brake backing plate. To back off the adjustment, you want to turn the star wheel up using a bent screwdriver or a special tool called a brake spoon that costs just a few dollars. With the brake drum off and carefully set aside, you're ready to clean the outer wheel bearings and bearing races. Buy a non-flammable cleaning solution at an auto parts store and pour it in a coffee can or jar. Being sure to wear protective gloves, slosh the wheel bearing up and down in the cleaner to wash the old grease off of it. Place it on a clean surface and let it air dry. Using a cloth to dry it may leave lint on the bearing surface, which you don't want to do. 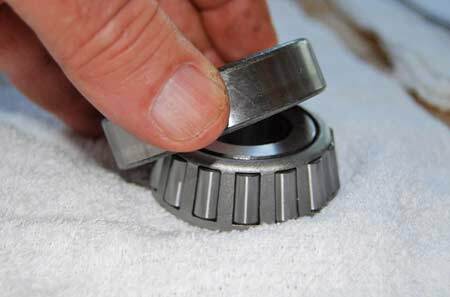 Carefully inspect the bearing for cracks or nicks in the smooth metal. It should be free of all rust. Check for wear patterns or excess wear on one side of a ball bearing. Also check to be sure the bearing race has no similar damage You will have to replace any assemblies that are not in top condition. Repacking the clean (or new replacement) bearing can be done by hand using special wheel bearing grease sold at any auto supply outlet for $5 or less. Take some grease in your gloved hand and work it into the bearing. Clean grease should also be used to cover the inside of the hub and spindle with a light coat of grease. Over-lubrication should be avoided, because it can lead to grease squeezing out of the hub and ruining your brake shoes. Set the repacked outer wheel bearing on a clean surface and begin the removal of the inner wheel bearing, which is still inside the hub-and-drum assembly along with its race and a grease retainer or seal. With the hub side of the rum facing up, use a hammer to lightly tap a large wooden dowel or stick against the inner bearing race. This will force the three parts out the back side. These parts should also be cleaned and the bearing repacked. Packing the cleaned up or new ball bearing race with grease can be done by hand using special wheel bearing grease sold at any auto supply outlet. Now place the repacked inner wheel bearing and race into position on the back of the hub. Then reinstall the retainer/grease seal (assuming it's re-useable). With a new car, a new retainer/seal should be used, but they are not readily available for some older cars, so often the old one must be re-used. Check the fit. Remember, this seal keeps grease from leaking out and getting on your brake shoes. If the seal is heavily damaged, you'll need a new one. Try a swap meet, old auto parts store or online auction. Modern replacements of the same size may also be available. Ask the counter man at the store for help. Remount the wheel and tire and tighten the lug nuts. Eliminate any king pin or ball joint play by using a wooden wedge. Then tighten the castle nut or adjusting nut with a 8- to 10-inch long wrench using only your arm and shoulder strength, just enough to make sure the parts are "seated." Then back off the nut until the first perceptible looseness is felt in the bearing when you grab the tire at the top and bottom and shake it. Then tighten the nut until one of the slots in the "castle turret" lines up with a cotter pin hole in the spindle. Insert a new cotter pin and cinch it tight by bending the ends in opposite directions around the nut with your pliers. Re-install the dust cap. If there is a spring-type radio static suppressor that goes inside the dust cap, install it, too. On newer model cars, you may find pin-shaped roller bearing that taper on one end like these. This completes the job of repacking the wheel bearings on one side of the car. Repeat the entire process on the other side of the car. If you backed off the brake star wheel to remove the hub, you'll have to redo the original adjustment by moving the wheel in the opposite direction the same number of clicks. When the wheel bearings on both sides are properly adjusted, replace the hub caps, lower the car from the jack stands and remove the wheel chocks. You're ready to roll. Records the mileage, so you'll know when the job has to be redone. Most bearings you'll need for old car restoration projects should be available locally from auto parts stores or bearing supply houses. If you have any trouble locating a specific bearing, try Gene's Bearings, Inc., 538 S. Mains St., Shawano, WI. You can call them at (715) 524-3847. While Gene's does not specialize in only automotive bearings, this company can help you find just about any bearing you need for your car or a suitable substitute.